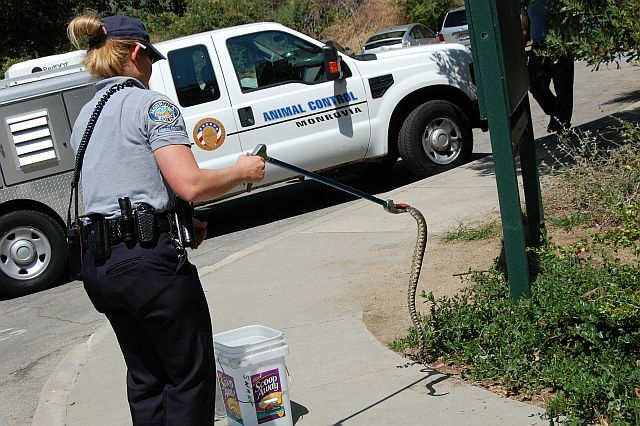 A Monrovia animal control officer snags a rattlesnake with a pole. The snake was spotted in the grass near the entrance to Monrovia Canyon Park on Monday, Memorial Day. The officer grabbed the snake with the device, and the snake hissed and rattled as she quickly placed the four-to-five footer into the plastic container. She was going to relocate it somewhere higher up in the San Gabriel Mountains, she said. So many lawmakers have lambasted Arizona over a law that would give police broad powers to detain and arrest someone for whom they have a reasonable suspicion is an illegal resident. But today in California, the governor’s budget does the same and much worse to California’s sick, elderly and poor. Schwarzenegger’s “May revise” budget proposes to eliminate the CalWORKS program, affecting 1.3 million people who usually get about $500 a month from the state. The savings would be about $1 billion. The governor’s new budget would also lay into home health care by cutting one-third for about $637 million in savings. Working moms and dads who received some relief for daycare would no longer — a cut that affect 140,000 children. Of course, we all know none of this is certain. In fact, in some ways, it is just the beginning of a protracted round of budget negotiations between Democrats and Republicans in the Assembly and Senate and the governor in his tent of meeting erected just below legislative offices. The goal is to eliminate about $20 billion and close the budget gap. One thing to watch for was hinted at in Assemblyman Anthony Portantino’s oped piece in the SGV Tribune and in www.pasadenastarnews.com today. In it, Portantino wrote about the Assembly taxation committee, which he chairs, “closing tax loopholes and eliminating tax breaks.” Look for the Assembly to ameliorate those cuts to welfare and in-home care with these tax changes, particularly to corporations. On a positive note, K-12 budgets would not be cut any more. And higher education — Cal State Universities and the University of California — would also not be cut any more and in fact, may see a slight increase.